Have you ever had to ‘fire’ a client? You know the ones… they are demanding, demeaning, they don’t value you or your time, nor are they very pleasant to work with. Well… I had a situation like that, recently. My very first one as a matter of fact! I suspected early on in the process it was a mis-match, so I kept my eyes open and picked up on several clues in our early meetings. Clue #2: The husband kept talking about “all the other work” that needed to be done in the house. The kitchen, the living room, the furniture, the window seat cushions, etc. Because he obviously went on and on about it, several times, it began to feel like he was holding up a so-called ‘carrot’ or promise of more work (and therefore wanted special treatment). Clue #4: After we finalized several fabrics they liked for their window treatments and upholstery, they took down the names of the fabric. Well, you know what happened next… when we met to talk about pricing, the husband showed me that he found the Ralph Lauren fabric ($439/yd Retail) online – at my wholesale price. Then he said they’d be “willing” to buy it from me, if I matched the online store’s price. (Wow) If things weren’t already on their way down hill, that was the clincher for me. I do not work on projects when the client provides the fabric. Do you? More clues: Did the previous company fire them as well? (More than likely). They’ve since called and emailed repeatedly saying how much they want to get started and move forward (with 1/2 the job btw). However, they lost the privilege of working with me and becoming a client. I choose not to devote another minute of my time, expertise, talent and skill to this pair. Do you remember the movie “Ghostbusters”? When I left their house for the last time, I felt as if I had been slimed! Too bad for them… they missed out. I’ve since walked away, shook the dust off my feet and moved on. 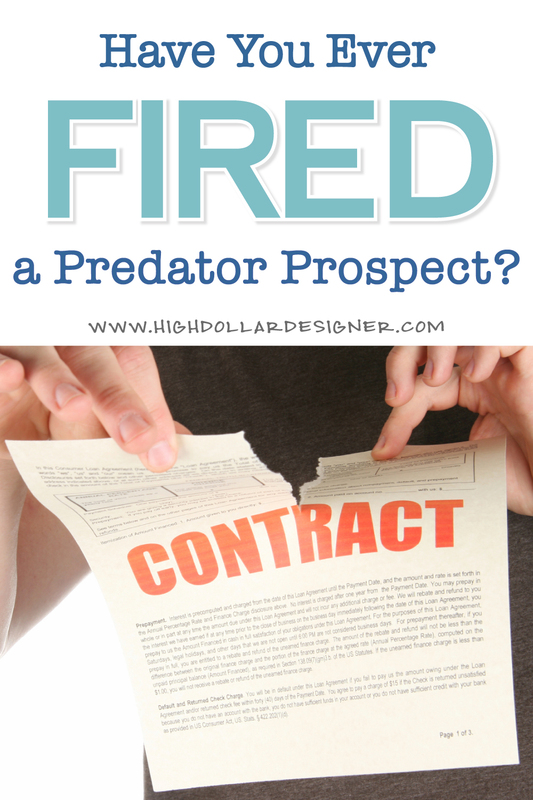 How long has it taken you to discover a ‘predator prospect’? Looking back were the signs there but you missed them early on? Bernadette… you are so right! And it’s too bad the client doesn’t realize they don’t really get what they’re looking for in the end… a harmonious space, at a fair price and a nice relationship with a talented, creative individual. The sooner we as designers realize they are not ‘ready’ for us and the services we provide, the better for everyone involved. I continue to bump into these personalities in different forms. As soon as I detect they are harvesting info for a DYI I move on quickly. These clients will take as much time from you as they can trying to get your ideas for free. They do not value your time or expertise enough to pay market rates and understand they are getting value for the money they invest in your services. Wish them a good day and move on. Unfortunately we as designers must have our own ‘radar’ up to be able to detect the DIY predators. I do think however that it’s an art and a skill to discern who is a ‘predator’ and who really just needs more ‘hand holding’ before they’re comfortable with purchasing. Yesterday, for example, I was helping a family member with window treatments, paint colors, furniture, etc for their home. What typically takes 1 – 2 hours with most clients, took about 6 hours. Which is fine, because she’s family and I enjoy our time together. However, it did remind me that some clients need more hand holding than others. Discerning the hand holders vs the predators I believe requires a business head that can tell the difference, and also knows when to move on, gracefully. Yes, I agree that it takes a business sense coupled with experience to discern between a potentially worthy client and a design scalper. When I was just starting out I would take any client and bend over backward to make it work hoping I would win over their longterm business. And I did, but only after much wasted time and loss of revenue- and expectations of continued low costs to them! So I had to change my tactic: Right up front I educate my clients on the value of a designer. Help them see that I am not a discount broker, that I bring much more to the table than being an order taker like these online sites. I do the research, see the whole picture, think about issues and resolve current or potential problems. And if they still don’t believe my time is valuable and think they can achieve the designer look they are after without my expertise than lets part now. But first I had to develop enough confidence in MYSELF and my own value to know when to say enough was enough! Andrea… great job! You have the ‘magic formula’. Developing confidence in your own skills and abilities, and then knowing what you will and will not put up with are very valuable lessons. It appears they’ve come at a bit of a ‘price’ from early on in your career… but I’m confident those lessons have been well worth it… especially in how you work with your clients and prospects today. I’m guessing your clients and the work you do for them is much more satisfying these days than it ever was before. Kudos to you! We work in the Caribbean since 30+ years… It happens all the time. Each second or third client seems to be like that. Expats and locals. Expats from the US much more so. Seems a bad habit. It’s relatively easy to detect as it always happens right at the beginning of the ‘relationship’. C’est la vie! Hi Adrian… Ugh! But then again… good thing it happens at the beginning of the relationship. That way you don’t end up spending too much time with someone not interested in purchasing from you. You must have gotten so good at discerning the good ones from the bad ones! Kudos to you for that! I’ve probably been doing this longer than you, as you seem a lot younger. It took you longer to fire these people than it does me. But, I have a golden rule I will not change. I do not charge for my first visit. If I don’t like the atmosphere, it’s over. And while I don’t charge for the first visit (hour), and things are going just swimmingly, I can pulo out a contract and say, Well, we’re on the clock now, so let’s sew things up, and set the next appointment. Thankfully, this happens most of the time, and this is part of why I completely gave up real estate in 2010 to do this exclusively instead of in tándem. I’m happier and more in control of who I am working with. I love this approach, as an emerging designer, I have been in the industry for sometime as a furniture sales person. I have often had customers who do this only at the furniture store!! Therefore as I began to go into the field I will need to be able to discern and establish my position early on to maintain a professional demeaned! It’s a thin line between establishing a clientele by bending over backwards but quite another to give services away!! And in the end we disappoint ourselves and then the customer goes on to do this to others. In the end we do no one no favors!! This forum is very helpful!! Congratulations Darlene! Starting out as an emerging designer it really is great you are recognizing where you ‘draw the line’ with prospects early on. It will help you tremendously in the long run to have that clearly defined. And I agree, you bring up an excellent point! No bending over backwards for clients. It truly is a disservice to everyone involved now and in the future – the current designer, the prospect, future designers, etc. gave me the impression she needed my services. So I gave her the quote and yardage needed for the fabric and trims. Had to call RA to get the repeat. After giving her the info I called her several times to get updates. She did not even have the integrity to call back. I don’t usually fall for that but did this time. The designers I work with here are a great group of men and women who really treat the vendors graciously. So I suppose there is some lesson for me in that situation with the FL lady. Sometimes it is the consumer I let slide because they do not have any business social skills. They are usually just self absorbed. You would hope others in this business would have more class. Sometimes I feel as if I don’t know anything in this business and I have been doing it over 22 yrs. I am mostly a workroom to the trade. I will do work for clients who know what they want and they put all the colors together themselves. If they need their hands held I refer them to the designers I work with in the network. Has been working really good. My designers bring me work and I bring work to them. Ooh Kathleen… I just cringe when that happens. I don’t know about you, but it always takes me by surprise. It really is a lot of work to estimate yardage and provide quotes. And I don’t think people realize that. One of the things I do with my coaching clients is to refine and improve their pre-sales processes so they don’t spend too much time with someone who isn’t going to buy. It’s a weeding out kind of thing. Congratulations on having a fantastic client base that treats you well and with respect! You must do the same and have worked hard for that kind of client base. Kudos to you! Thanks Barbara, for sharing your experience. I have people asking me if there are any discounts in my services. And I’m like really, do i look like a discount store to you. I just say I’m very reasonably priced and if you have a budget than I can definitely, work with that but I don’t offer discounts.I give them what their budget can get them. One lady even suggested that I do it for free. Oh! how I really had to keep my cool on that one. People want everything and don’t want to pay if they can get away with it. Its absurd. Oh Farha, I have been there too, but more early on in my design career. Yes, I have gotten asked about discounts over the years, and I have done the same as you… remind them of the services I offer, how I’m different from the next person (or big box store), and the benefits they achieve from working with me that are far greater than price. And since I’ve done my homework up front, and present a VERY professional persona and brand (website, business cards, sales systems, follow up checklists, postcards, contracts, etc), I just don’t get asked that question anymore. Good job on ‘keeping your (professional) cool’. I have fired four clients in eleven years. The first was a simple case of one spouse did not want to do the project and kept trying to alter the contract. It was a small job so I concluded that it was better to walk away. The second one I should have seen the warning signs. A horder with unfinished projects around the house. The third one was a “friend” who thought it was okay to breach our contract because we were ‘friends’. I have since did other projects for friends that went really well. The last one was tough. Think mid 2011, height of the recession. $60k kitchen remodel. Client has popcorn ceiling. Drags their feet and does not get it tested for asbestos despite promising to do so. We are down to the wire and she informs me that she has finally sent in the asbestos sample in for testing. She refuses to share the test results, I say good bye. I would like to think that I am getting better at identifying clients who are not a good fit but I am not going to beat myself up if another one slips through the cracks. Excellent Molly! Good job at getting better at identifying the ‘less than desireable’ clients up front. It’s always a learning curve, so keep at it! This discussion is a fresh air for me! I hope that we as professionals have the mission to keep sending the right message out there. In the end, people may realize that financially difficult times do not equal cheating the professionals, who can empower the client in the long run. Thank you all for the great forum – Barbara and every one participating!!! Great thoughts and priceless advice! Elizabeth, you bring up an excellent point… the education of the prospect and sending the right message. If the prospect is made aware of our policies early on, and we are excellent detectives watching for clues ‘along the way’, then much of the problems that arise could be eliminated entirely. I know that whenever I ‘fudge’ or compromise on one of my own policies, or ‘give a little’ (and yes I too still want to do that at times)… sometimes that’s the exact place where the breakdown happens! Keep up the good work Elizabeth! Let’s send the ‘right message’ to prospects! PS: How do you ‘educate’ prospects ahead of time? Company policies, how you work, pricing and fees, etc? Gave him the full deposit back and said AMFYOYO. It was very liberating and I neither miss him, nor the money and especially the headache. Wow Michael! I’d say you certainly went above and beyond for that client. And yes, good riddance. I had to Google AMFYOYO as I hadn’t heard that one before… and I’d like to commend you. You were quite polite. Kudos! For anyone else who’s not sure… AMYFYOYO = Adios, My Friend, You’re On Your Own. I tell prospective clients up front that I don’t shop retail with them. I don’t use any items (that are to be purchased) that I don’t provide. I also don’t usually tell them the vendors information. I do almost everything COM, so that eliminates them trying to go online to copy a sofa or chair. The most interesting twist, a client who was a long time friend wanted to use a long time contact who made custom slip covers. I said that was fine, gave the fabric to my client so she could deliver it. About a week later, I get a call from the fabric company. They asked if I had just called in an order for 30 yards. Of course not..I always order with a PO. That friend of mine pretended to be me and said she didn’t have my account number available. I really blew my stack. I called her and told her how low that was and the company called me. To this day I have not forgiven her.